New York, NY — October 10, 2011 — Wines That Rock, innovators of rock inspired wines, announced today the launch of the Grateful Dead “Steal Your Face Red Blend” to join the brand’s four established rock ‘n’ roll varietals; Rolling Stones “Forty Licks Merlot,” “Woodstock Chardonnay,” The Police “Synchronicity Red Blend” and Pink Floyd’s “The Dark Side of the Moon Cabernet Sauvignon.” Wines That Rock began releasing the labels in 2009 and a portion of the proceeds from every bottle sold are donated to the T.J. Martell Foundation. Grateful Dead Productions and Rhino Entertainment have partnered with Wines That Rock to create the “Steal Your Face Red Blend.” Wines That Rock is a partnership between legendary rock business managers RZO and award-winning winemakers Mendocino Wine Co., to capture the quality and spirit of rock ‘n’ roll mythology in its portfolio of great tasting wines, iconic album art for labels, earth friendly production and great consumer value. Wines That Rock are crafted from the hands and vision of Mendocino Wine Co. winemaker Mark Beaman, whose talent and passions are quality, sustainability and pure rock ‘n’ roll. The process for making “Steal Your Face” began by listening and discovering the vibe and intricacies of the band during their legendary multi-night performance at San Francisco’s Winterland Ballroom in 1974. Wines That Rock takes its respect for music very seriously, with founders that have been at the forefront of bringing rock ‘n’ roll to millions of fans for decades. Co-founders Ron Roy and Howard Jackowitz originally partnered with RZO and David Bowie in 1997 to create UltraStar Entertainment, the world’s largest online fan club company pioneering fan club ticketing and online artist communities. UltraStar’s clients range from the New York Yankees to AC/DC, Madonna and The Who. The Grateful Dead “Steal Your Face Red Blend” made its official public debut October 6th, 2011 and is currently available for order at www.winesthatrock.com and at more than 1,500 retail locations worldwide. Available directly from its website, Wines That Rock offers variety packs of all current varietals and a collectors T-Shirt ($69), as well as three-bottle packs ($49). 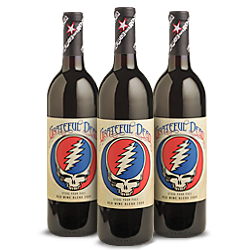 Wines That Rock will offer the Grateful Dead “Steal Your Face Red Blend” in three, six and 12-bottle packs at around $16.99 per bottle. Individual bottles are competitively priced at your local retailer. For more information, please visit www.winesthatrock.com.